We're changing the format of new releases at Uniko Studio: now we'll have a day dedicated to each new product, with the products' full reveal and availability for purchase on April 11th. We'll still be celebrating the actual release date with a fun blog hop - you don't wanna miss it! For my project today, I wanted to show you that you can still have fun with the designer dies even if you don't own the coordinating stamp set (yet!). My simple tag features all three of the designer dies (all three come as one set). The sentiment is actually a sneaky peek of a future set - I was just really taken with that font. It reminded me of the 1920s and persuaded me to take advantage of my gold obsession right now! A tip from my buddy, Debby: don't separate the dies when you receive them. You can create cool projects with the dies joined together; they're all lined up to perfection! Don't pile on the pressure with stamping those sentiments in the apertures. Lightly tack the die-cut white tag to a sheet of gold cardstock then stamp your sentiments in the apertures. If you bodge it up, just tack the white tag to another area of gold card and start again. Then trace the tag on to the gold card and cut it out (if you want a neat reverse to the tag, die cut another tag from white card and adhere to the reverse). When stamping on glossy/shiny cardstock, consider using a permanent ink such as Staz-on. Just be sure to wipe it off any clear stamps immediately after use to avoid damage! That's all from me today, but be sure to get a good sneaky peek at what some of the Uniko Studio DT whipped up with these dies, including our fabbie guest DT and talented buddy of mine, Taheerah! Gorgeous tag! Love the gold! Y'know, I did think about not taking my dies apart to be able to create something like this, but my design idea won over and I had to captiulate! :-D Guess that means I'll just have to get a second set huh? 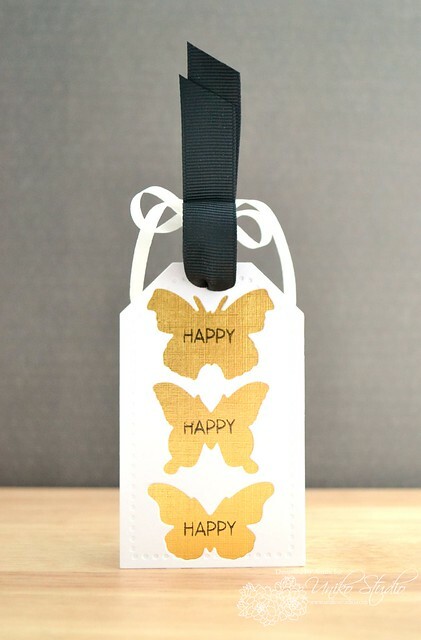 ;-) Awesome tag Aimes - I love how you used your gold to bag the negative die cut - super-sophisticated result!! Such a gorgeous and elegant tag! amazing, Amy! the gold is so rich and beautiful! think i can weld my dies back together?...lol! This is such an elegant tag! I love the gold and the dark black ribbon. Gorgeous! This is so pretty. I love how you tied the ribbon...and the golden die cuts are fabulous! Elegant tag. As always thanks for the tips. Love your gorgeous gold paper! Fab tag!! Great tag - the gold shimmering through the butterfly outlines really draws the eye. Thanks for joining us for this week's Simon Says Stamp and Show Challenge!